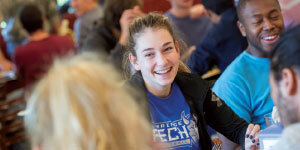 As you might expect for a university that has “technological” as its middle name, Lawrence Technological University has nationally recognized engineering and science programs. But the private 4,500-student university isn’t resting on 86 years of laurels. Instead, it’s expanding into the frontiers of science, with growing programs in Biomedical Engineering, Robotics, and more. If you’re interested in one of the fastest-growing professions, LTU’s Nursing program in the College of Arts and Sciences combines clinical experience with the unique advantages of a STEM-based university. 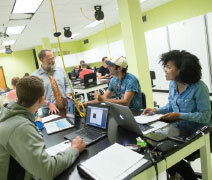 If working with computer technology is your thing, the College of Arts and Sciences also offers bachelor’s and master’s degrees in Computer Science, with concentrations in Business Software Development, Game Software Development, Scientific Software Development, and Software Engineering. If another technology route intrigues you, the College of Engineering offers a bachelor’s degree in Computer Engineering that combines the best of electrical engineering and computer science. You can also enter the exciting field of robotics with a Bachelor of Science in Robotics Engineering, which blends mechanical and electrical engineering, robotics, and computer science. The program also provides labs with test areas, build benches, robotics kits, and large industrial robots exactly like those used today in advanced manufacturing. Then there’s Lawrence Tech’s longtime engineering degree, the Bachelor of Science in Mechanical Engineering. In a field where it’s possible to design and build machines and devices, you can combine creativity and ingenuity to solve some of society’s toughest problems and bring ideas to life. Be part of building a better future with a combined bachelor’s and master’s degree in Architectural Engineering, which combines architectural knowledge with specialized engineering skills for structures that are durable, economical, and healthy. Or prepare for work as a construction manager—planning, directing, and coordinating building projects—with a Bachelor of Science in Construction Engineering Technology and Management. Perhaps you’d rather work on the vehicles of tomorrow. 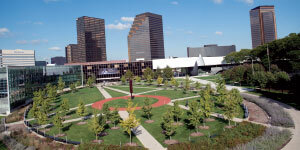 LTU offers a Bachelor of Science in Transportation Design through its College of Architecture and Design. Pursue your creative design talents while gaining a comprehensive understanding of automotive technology. Your design may be prominently displayed at the North American International Auto Show in Detroit, one of the world’s top auto shows. LTU’s Bachelor of Science in Biomedical Engineering allows you to develop and improve assistive technologies and disease treatments, from imaging equipment to artificial joints. Using new laboratory equipment, you can build microscopic machines to diagnose and treat diseases. You may also work closely with nonprofits and the Department of Veterans Affairs to build devices that directly improve the lives of people with disabilities. You can join one of LTU’s 60+ student clubs and organizations, play a sport on one of LTU’s men’s or women’s athletic teams, or cheer them on as a member of the marching band or dance team. Since LTU—located in Southfield, Michigan—is near the largest concentration of engineering, architecture, and technology jobs in the world, you’ll have lots of opportunities for co-ops and internships. Take advantage of the 100+ career service events each year and the 300+ companies that recruit on campus.